In 2016, some of John Heard’s corn nitrogen plots yielded over 200 bu/ac with the University of Manitoba plot combine. He refused to report such astounding yields until the electronic weighing system had been verified with bagged and weighed yields. Likewise scrutiny and calibration is required when using yield monitors for strip trial tests. In 2016 Manitoba Agriculture and Manitoba Wheat and Barley Growers Association compared harvest weights from strip trial yields in on-farm-tests looking at nitrogen and wheat protein. Several farms had scaled grain carts in addition to their combine yield monitor (Figure 1) and all plots were measured with a weigh wagon. Figures 2 and 3 shows the trends of grain cart and yield monitor data versus the weigh wagon yield (solid line). Figure 1. Comparing yield measuring systems – combine yield monitor, scaled grain cart and weigh wagon. Farm A – with scaled grain cart used to calibrate yield monitor. Yields follow trend of weigh wagon weights and are within 2 bu/ac. 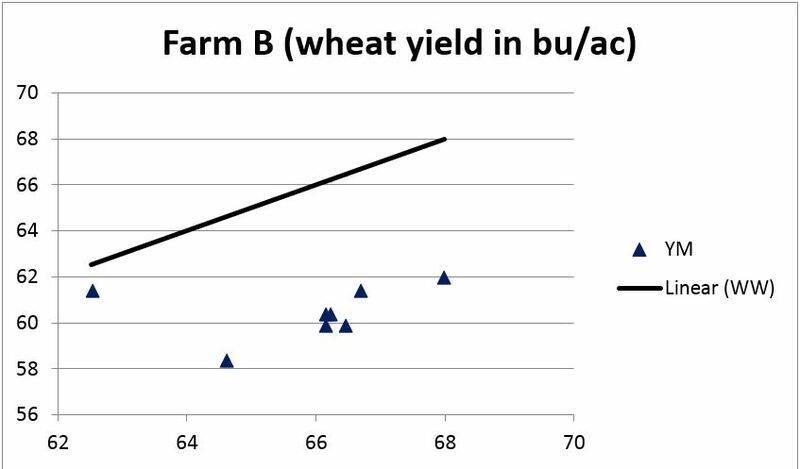 Farm B – A seldom calibrated yield monitor with yields not corresponding to weigh wagon weights and up to 6 bu/ac less. 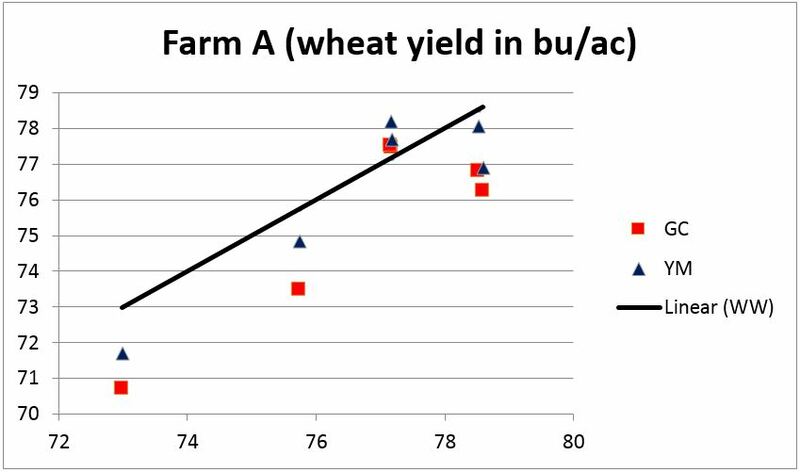 Yields from a perfectly calibrated yield monitor and grain cart would fall on the black line in the graphs above. Farmers with accurate, scaled grain carts were usually calibrating their yield monitors in each field and producing very similar results as the weigh wagon (such as Farm A). Those that were calibrated on earlier fields or earlier in the season were unable to measure the subtle yield differences in this study and may lead to erroneous conclusions. So if yield monitors are being used to measure strip trial yields, I encourage growers to calibrate often with their scaled grain carts or a weigh wagon if available. The measurements we made were in dry wheat but if crop strips are of varying moisture content, more frequent calibration may be warranted.